MasteringAstronomy should only be purchased when required by an instructor. For one-semester college courses in Introductory Astronomy. 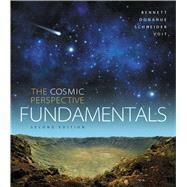 Inspired by an activities-based classroom approach, The Cosmic Perspective Fundamentals is the briefest introduction to astronomy in the Bennett series. By focusing on the process of science and fundamental concepts of astronomy, The Cosmic Perspective Fundamentals allows time for the use of other instructional tools in the course. Each concisely written chapter is formatted into two main sections followed by a Process of Science section, making learning targeted and expectations clear for students. The Second Edition of The Cosmic Perspective Fundamentals presents recent dramatic advances in astronomy and how they change our understanding of the cosmos. This new editionfocuses on essential subjects of astronomy chosen for their importance to the field, interest, and engagement level, using goal-oriented lessons and practical tools tobring astronomy to life. The textbook is now supported in MasteringAstronomy to create an unrivalled learning suite for students and instructors. JEFFREY BENNETT, a recipient of the American Institute of Physics Science Communication Award, holds a B.A. in biophysics (UC San Diego), and an M.S. and Ph.D. in astrophysics (University of Colorado). He specializes in science and math education and has taught at every level from preschool through graduate school. Career highlights including serving 2 years as a visiting senior scientist at NASA headquarters, where he developed programs to build stronger links between research and education, and proposing and helping to develop the Voyage scale model solar system on the National Mall (Washington, DC). He is the lead author of textbooks in astronomy, astrobiology, mathematics, and statistics, and of critically acclaimed books for the public including Beyond UFOs (Princeton University Press, 2008/2011), Math for Life (Bid Kid Science, 2014), What Is Relativity? (Columbia University Press, 2014), and On Teaching Science (Big Kid Science, 2014). In 2014, his five children’s books (Max Goes to the Space Station, Max Goes to the Moon, Max Goes to Mars, Max Goes to Jupiter, and The Wizard Who Saved the World) became the first books launched to the International Space Station for the Story Time From Space program. He lives in Boulder, CO with his wife, children, and dogs. His personal website is www.jeffreybennett.com. Megan Donahue is a professor in the Department of Physics and Astronomy at Michigan State University and a Fellow of the American Association for the Advancement of Science. Her current research is mainly about using X-ray, UV, infrared, and visible light to study clusters of galaxies: their contents–dark matter, hot gas, galaxies, active galactic nuclei–and what they reveal about the contents of the universe and how galaxies form and evolve. She grew up on a farm in Nebraska and received an S.B. in physics from MIT, where she began her research career as an X-ray astronomer. She has a Ph.D. in astrophysics from the University of Colorado. Her Ph.D. thesis on theory and optical observations of intergalactic and intracluster gas won the 1993 Trumpler Award from the Astronomical Society for the Pacific for an outstanding astrophysics doctoral dissertation in North America. She continued postdoctoral research as a Carnegie Fellow at Carnegie Observatories in Pasadena, California, and later as an STScI Fellow at Space Telescope. Megan was a staff astronomer at the Space Telescope Science Institute until 2003, when she joined the MSU faculty. Megan is married to Mark Voit, and they collaborate on many projects, including this textbook and the raising of their children, Michaela, Sebastian, and Angela. Between the births of Sebastian and Angela, Megan qualified for and ran the Boston Marathon. These days, Megan runs trails, orienteers, and plays piano and bass guitar whenever her children allow it. Nicholas Schneider is an associate professor in the Department of Astrophysical and Planetary Sciences at the University of Colorado and a researcher in the Laboratory for Atmospheric and Space Physics. He received his B.A. in physics and astronomy from Dartmouth College in 1979 and his Ph.D. in planetary science from the University of Arizona in 1988. In 1991, he received the National Science Foundation’s Presidential Young Investigator Award. His research interests include planetary atmospheres and planetary astronomy. One research focus is the odd case of Jupiter’s moon Io. Another is the mystery of Mars’s lost atmosphere, which he hopes to answer by serving as science lead on the Imaging UV Spectrograph on NASA’s MAVEN mission. Nick enjoys teaching at all levels and is active in efforts to improve undergraduate astronomy education. In 2010, he received the Boulder Faculty Assembly’s Teaching Excellence Award. Off the job, Nick enjoys exploring the outdoors with his family and figuring out how things work. Mark Voit is a professor in the Department of Physics and Astronomy and Associate Dean for Undergraduate Studies in the College of Natural Science at Michigan State University. He earned his A.B. in astrophysical sciences at Princeton University and his Ph.D. in astrophysics at the University of Colorado in 1990. He continued his studies at the California Institute of Technology, where he was a research fellow in theoretical astrophysics, and then moved on to Johns Hopkins University as a Hubble Fellow. Before going to Michigan State, Mark worked in the Office of Public Outreach at the Space Telescope, where he developed museum exhibitions about the Hubble Space Telescope and helped design NASA’s award-winning HubbleSite. His research interests range from interstellar processes in our own galaxy to the clustering of galaxies in the early universe, and he is a Fellow of the American Association for the Advancement of Science. He is married to coauthor Megan Donahue, and cooks terrific meals for her and their three children. Mark likes getting outdoors whenever possible and particularly enjoys running, mountain biking, canoeing, orienteering, and adventure racing. He is also author of the popular book Hubble Space Telescope: New Views of the Universe. Why do the constellations we see depend on the time of year? Why do we see phases of the Moon? Why did the ancient Greeks reject the real explanation for planetary motion? How did the Greeks explain planetary motion? How did the Copernican revolution change our view of the universe? How can we distinguish science from nonscience? How does the fact of gravity differ from the theory of gravity? What features of our solar system provide clues to how it formed? What theory best explains the orderly patterns of motion in our solar system? How does our theory account for the features of planets, moons, and small bodies? How do we determine the age of Earth and the solar system? What determines a world’s level of geological activity? How does an atmosphere affect conditions for life? Why did the terrestrial worlds turn out so differently? What unique features of Earth are important for life? What are Jovian planets like? Why are Jovian moons so geologically active? Why are asteroids and comets grouped into three distinct regions? Do small bodies pose an impact threat to Earth? Did an impact kill the dinosaurs? How do we detect planets around other stars? What properties of extrasolar planets can we measure? How do extrasolar planets compare with planets in our solar system? Do we need to modify our theory of solar system formation? How does energy escape from the Sun? How do we measure the properties of stars? What patterns do we find in the properties of stars? How did we discover the patterns in stellar properties? Why do stars shine so steadily? Why do a star’s properties depend on its mass? What will happen when our Sun runs out of fuel? How do high-mass stars end their lives? What do star clusters reveal about the lives of stars? What happens to space and time near a black hole? What are the major types of galaxies? What is the evidence for supermassive black holes at the centers of galaxies? How do distance measurements tell us the age of the universe? What do we see when we look back through time? How did the early universe change with time? How do observations of the cosmic microwave background support the Big Bang Theory? How do the abundances of elements support the big bang theory? Did the universe undergo an early episode of inflation? How did structures like galaxies form? Will the universe continue expanding forever? What is the evidence for dark energy? Could there be life elsewhere in our solar system? How can we identify habitable planets?